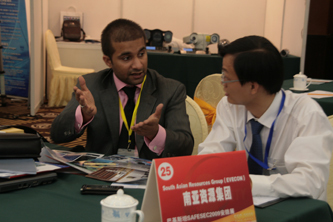 South Resource Group:This time I came China to look for suppliers. We are South Resource Group, one of the largest security enterprises in Pakistan. We are doing business cooperation with CSPIA now, by what more and more enterprises from Pakistan will be connect with China companies. Many security groups spread in such as Japan, USA, Germany and so on like this kind of countries, we hardly build business with them, instead in China, we have many partners, that is why I pay much more attention on China security market. 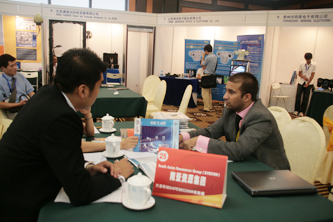 The suppliers attended the conference all took their innovative products that are really excellent in quality and technology. Besides, products cover all category and ranges, including military uses, law court, government, police, commercial and household. There is security expo in Pakistan, many companies and visitors from China will turn up in the show to make sale by this stage. South Resource Group:First of all, China Security and Protection Industry Association (CSPIA) did a very good job as SSC’s organizer by offering such a precious communication platform for us. SSC brought so many preferential business partners, which saves much time and cost in sourcing. Meanwhile, Chinese suppliers are have interest to do business with companies from Pakistan. In SSC 2009, we have found several intention partners who have more needs on the security market information of Pakistan. They all look to the Pakistani market potential and prospect. With the pacific relations between China and Pakistan lasting more than 50 years, we see clear international business development situation. South Resource Group:We thank again for CSPIA’s good job, we will still pay much attention on SSC, and come to China to be SSC’s site again.